(CNSNews.com) - The federal government collected a record $1,143,141,000,000 in individual income taxes through the first eight months of fiscal 2018 (Oct. 1, 2017 through the end of May), according to the Monthly Treasury Statement released today. Despite the record individual income tax collections, the federal government still ran a deficit of $532,241,000,000 over those same eight months, according to the Treasury statement. The approximately $1,143,141,000,000 in individual income taxes that the Treasury collected in October through May of this fiscal year was $56,273,800,000 more (in constant May 2018 dollars) than the $1,086,867,200,000 (in constant May 2018 dollars) in individual income taxes that the Treasury collected in October through May of fiscal 2016—which was the previous record. 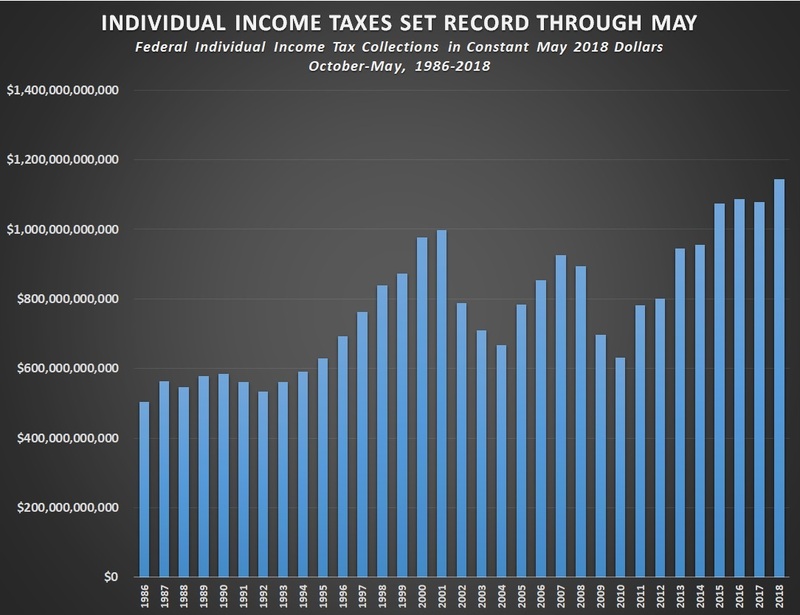 In fiscal 2017, individual income tax collections dipped to $1,078,064,960,000 (in constant May 2018 dollars) in the first eight months of the fiscal year. Although the federal government collected record individual income taxes in the first eight months of this year, overall federal tax collections were down from the first eight months of fiscal 2015, 2016 and 2017. In the first eight months of fiscal 2016, the Treasury collected a record $2,240,406,590,000 in total taxes (in constant May 2018 dollars). The $2,224,526,000,000 in total tax collected in the first eight months of this fiscal year is $15,880,590,000 less than that. Corporation income tax collections have also declined. In the first eight months of fiscal 2018, the Treasury collected $123,707,000,000 in corporation income taxes. That is $46,922,120,000 less (in constant May 2018 dollars) than the $170,629,130,000 in corporation income taxes (in constant May 2018 dollars) that the Treasury collected in the first eight months of fiscal 2017. In fiscal 2007, the Treasury collected a record $255,181,270,000 (in constant May 2018 dollars) in corporation income taxes. Despite the record individual income taxes that the Treasury collected in the first eight months of this fiscal year, the federal government still ran a deficit of $532,241,000,000 during the period. That is because while it collected $2,224,526,000,000 in total taxes, the federal government spent $2,756,767,000,000. The $2,224,526,000,000 in total tax collections through May included the record $1,143,141,000,000 in individual income taxes; the $123,707,000,000 in corporation income taxes; $753,437,000,000 in social insurance and retirement payroll taxes; $36,684,000,000 in unemployment insurance taxes; $2,878,000,000 in otehr retirement taxes; $55,695,000,000 in excise and gift taxes, $24,809,000,000 in customs duties; and $68,809,000,000 in miscellaneous receipts. Including the current month of June, there are four more months in this fiscal year. Tax amounts were put in constant May 2018 dollars using the Bureau of Labor Statistics inflation calculator.